Stacey Malcolmson, CFRE, is the managing director of campaign services at Clarkson Davis, a consulting firm committed to powering change that matters for nonprofit and socially focused organizations through the development of business operations, planning and fundraising strategies. Malcolmson previously led Southern Methodist University’s Alumni Giving and Relations efforts and launched the United Way of Metropolitan Dallas’s first-ever endowment campaign. Stacey earned a Bachelor of Arts from The University of Texas at Austin and an MBA from Harvard Business School. Fundraising and nonprofits go hand-in-hand like a horse and carriage, with one powering the change for the other. In this comparison, fundraising provides the means that allows nonprofits to carry out their goals with speed and efficiency. However, with more than 10 years of fundraising and consulting experience, the team at Clarkson Davis has recognized several pitfalls with nonprofits and how they approach fundraising. 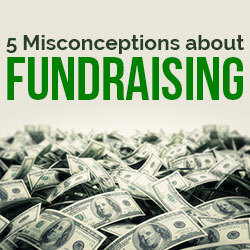 Many of these misconceptions can lead to putting the carriage before the horse, making fundraising harder than it needs to be. No matter how strong or effective a CEO is, raising money – especially for large-scale capital fundraising campaigns – takes a significant amount of time, energy and connections. Major donors typically give to an organization, but most often they give funds to a peer who is also giving to the organization. Peer to peer fundraising is the most effective and efficient way to raise money. Solution: Take the pressure off the CEO by building a team to support him or her. A team will distribute responsibilities and resources, alleviating the pressure off one person, while also drastically expanding the network of connections. Volunteers think of raising money like closing a business deal. Fundraising is inherently relational and not transactional. Successful business leaders often approach their fundraising like they approach their business deals. They focus on closing the deal. However, giving money away for a cause is not an easy decision like buying a tangible good or service, so more time and attention needs to be spent to get the donor comfortable enough to make a meaningful contribution. Solution: Educate volunteers to “put themselves in other peoples’ shoes.” A simple training explaining how executives make financial decisions and reasons for giving will cover the basics volunteers will need to know when fundraising. The Board approves but doesn’t give to the capital campaign. We see far too often boards of directors that approve capital projects, but when asked to make a contribution above and beyond their annual gift, they are reluctant to do so. raising as much money from the board as possible. We have one client whose board gave more than five times their collective annual gifts, and they hit 100 percent participation. Solution: If you are able to select the board leader, pick someone who will inspire giving through leading by example. If not, providing tangible results like participation rates and the total funds collected can encourage the board to give to meet or exceed these markers. The capital campaign budget only includes the hard costs of construction. Many times, nonprofits will only think of their capital campaigns in terms of construction and design costs. They have not thought through the need to expand their operating budgets to include increased staff and program costs that will result from a new building (assuming the expansion of programs). Taking the time to build a multi-year operating budget that can be partially financed in the capital campaign can be critical to ensuring the sustainability of the organization. Solution: Plan out foreseeable costs, especially plans for growth. The process of writing out the budget will also highlight other costs and fees that might not have been originally considered. Organizations who want to embark upon a capital campaign must be sure to have the following issues addressed: clean donor records, a meaningful and relevant vision supported by a business plan that supports the capital campaign, a well-respected and competent leader and board of directors, and a diverse and consistent donor base who are actively involved in giving to the organization. Solution: Stack the cards in your favor by building a solid base for fundraising efforts. Once an organization has a clear vision, competent leadership and a network of donors to contact, all that is left is to put the fundraising plan into motion. Fundraising doesn’t need to be difficult, and if you can avoid these pitfalls with your campaign, you will be well on your way to reaching your organization’s goals.